If the reeds and woodwinds player Harvey Wainapel has not been made an honorary Brasilian already, then it is time that he is made one. His two-part adventure with a super-constellation of stellar musicians from Brasil may have but twenty songs; however it has all the makings of an epic odyssey. 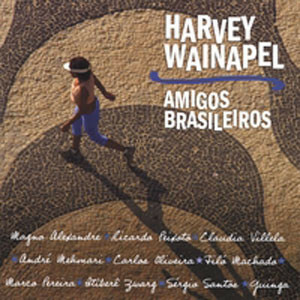 In Amigos Brasileiros Mr. Wainapel covers not only geography, but a comprehensive musical topography of the great South American country from choro to frevo, maracatú and samba and many more forms in between. Throughout Mr. Wainapel is heard playing his various instruments with extraordinary facility, displaying such extraordinary talent that it is impossible to forget each and every performance. He touches the music in more ways than one. Not only does he play the repertoire with nuanced expression, the kind that shows how expressive he is, but he also shows how technically supreme he is on clarinets and saxophones. His virtuosity thrills in a quiet sort of way. There is no flurry of notes; rarely a rush of multiple arpeggios and no big vibrato in notes or at the end of long rapidly labyrinthine lines. On the contrary Mr. Wainapel reaches out of his horn as if it were a part of him. The best way to describe his playing is that it sounds like the voice of a vocalist who is immersed in the art of the song in such a way that his phrasing and accents are exquisitely original like the graceful wordless singing of someone scatting brilliantly. Mr. Wainapel’s lyricism is another feature of his playing. He exploits perfectly the wood of his clarinets and the metal of his saxophones—each in its own special way. But he is characteristically warm and moist in tone and dramatic in manner. And there is something magical in everything he plays, both here and elsewhere, on other recordings. Here, however, Mr. Wainapel shows himself to be possessed of a superb swing and a sensuous shuffle as if he were mimicking the dancers in a Brasilian landscape. His soli are short and potent and they are based on the fact that every note must be meaningful as if his life depended on it. On these two recordings Harvey Wainapel also shows himself to be an extraordinary composer and arranger as well. In addition to his love for Brasilian music, the listener will hear great attention to detail in the writing and arrangements that are brought to life by an array of superstars from Brasil. It is the craftsmanship of the music that seduces the musicians encouraging them to give beautiful performances, ones which are indicative of the deep respect that exists between the musicians. For instance the performances of the great Brasilian guitarist and composer Guinga and Marcus Tardelli, whom Guinga has praised as perhaps the finest guitarist to ever come out of Brasil in recent times, go beyond the pale. Each musician gives off his best in his own special way, indicating the respect each has for Harvey Wainapel. This is carried through both the first and the second CD in this set. This is reminiscent of the outcome of Toots Thielemans’ Brasil Project. Where Mr. Wainapel’s project differs from this admittedly more famous cousin is that Harvey Wainapel has gathered together a larger cast of musicians and remarkably he has found a group, which, baring a few obvious names comprises musicians who are not immediately known to audiences in the northern part of the continent. In this and in many other respects this is what characterises a famous Brasilian who did the opposite of what Harvey Wainapel has done here: Moacir Santos migrated to the US, settling on the West Coast and on his legendary and now difficult to get US recordings also brought many relatively lesser known musicians into his mythical fold giving them the opportunity to gain greater acceptance in the US and enhance their respective reputations. Of the two CDs, the first one seems to comprise of mainly more traditional Brasilian forms of music. The breathtakingly beautiful frevo, bãiao and choro are remarkably performed both by Mr. Wainapel as well as the superlative cast of musicians. 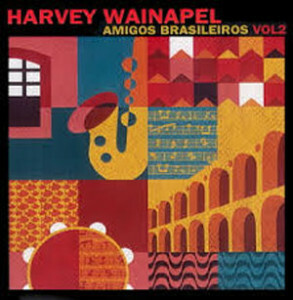 Harvey Wainapel also knows his choro well and pays rich tribute to one of its greatest exponents, “Pixinguinha”. But it is the track before that where the reeds and woodwinds player shines brightly: “Procurando em Caminho” is absolutely breathtaking, a choro of immense beauty written by Magno Alexandre and executed to perfection by both musicians here. On this CD there are also two recordings by Harvey Wainapel. “Sempre Voltando” and “A Garota da Garoa” are playful and witty and exquisitely composed. Their structure and emotion is poised and seemingly spun of the finest thread that glimmers as each of the songs unfold chorus by chorus. It is here that the imagination of Mr. Wainapel soars as he leads his musicians into his world where fantasy and reality become perfect bedfellows. The composer is able to fuse both elements of style into a concrete idiom that becomes the glue that holds his music together magnificently. CD 2 is the shorter of the two recordings by two songs. But it is no less appealing than the first. 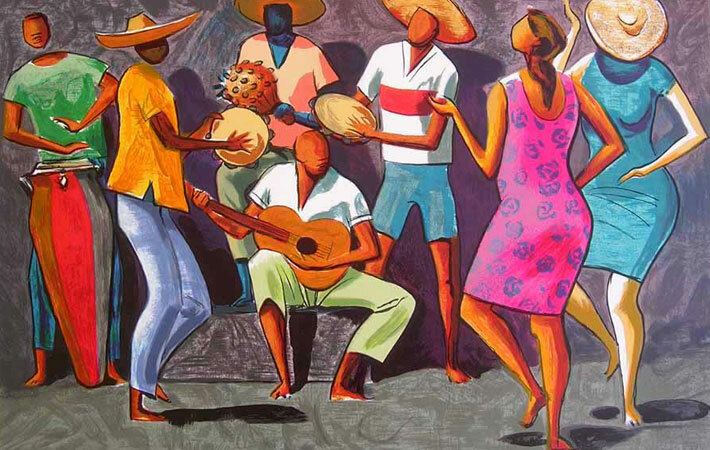 The music here is less dependent on the formal structures of classic Brasilian folk forms, but is no less worshipful of Brasilian music. Among the luminaries on this recording are pianist Weber Iago and the ineffable pianist Léa Freire. The chart in which she appears also features the remarkable bassist Tibô Delor, whose short arco performance is one of the highlights of the entire project, all twenty songs of it. Mr. Wainapel’s clarinet solo is also one of the finest on both sets. Another remarkable feature of this CD and the first one as well is that Mr. Wainapel has shared credits with the musicians who have contributed performances and songs to each of the CDs, making this one of the truly collaborative projects. More than anything else, it is the riches of the two CDs being more well spread-out across the two sets of performances that make both these CDs entirely desirable. Another revelation from these projects is the fact that Brasil does not only produce great guitarists but also pianists and percussionists and strings and horn players. And this is a fact that not many project leaders have been forthcoming in bringing out.